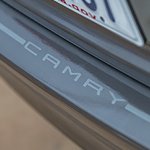 The Toyota Camry is consistently ranked as one of the most desirable family sedans around. Rated by U.S.News as the number one midsize sedan on the current market, this redesigned sedan delivers all the reliability and comfort that you expect from this long-time winner. A new exterior design provides a sleek shape with plenty of curves and delineated surfaces. The side rocker panels and the rear spoiler not only lend an emphatic style but also provide redirected airflow for improved efficiency. The available gloss-black grille with an available mesh insert lends a distinct appearance as the Toyota glides down the highway. When you are ready to take one of these sedans out for a test drive around Prestonsburg, come in to Mann Toyota, and we will gladly place you in one of our many models. You will return from your drive with a complete assurance of the Toyota Camry's superb qualities.